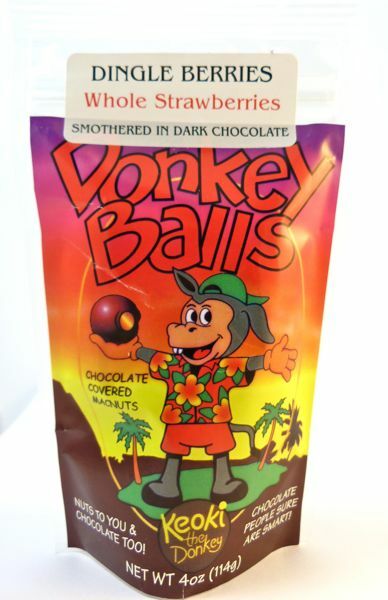 I can always count on a new chocolate in the Donkey Balls product line-up. 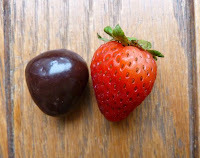 This Hawaii-based brand started with several chocolate covered macadamia nut items and has expanded to other chocolate-covered nuts and berries, such as today's Dingle Berries -- strawberries covered in glossy dark chocolate. Whole fresh strawberries partially dipped in melted chocolate can brighten up a lot of dessert plates. But, if its the wrong time of year for fresh berries, and you want something on the irreverent side, check out what Donkey Balls has in season.